1Franklin University, Columbus, USA; 2Nova Southeastern University, Fort Lauderdale, USA. Received October 22nd, 2009; revised November 29th; accepted January 3rd, 2010.
orientation than their American counterparts. Suggestions for managers and implications for future research are presented. leaders as they tend to influence workers more positively. institutions that take society’s needs into consideration. in order to be followed and respected. culture, age group, and gender. ing officer (COO), president, or vice president” . just as true in Afghanistan as it is in the United States. have similar transformational leadership scores. data yielded no eviden ce for a curvilin ear effect. .
overall wisdom, and communication or listening skills. well as in coordinating actions of multi ple actors  . developed by Bass and Avolio for leadership studies. 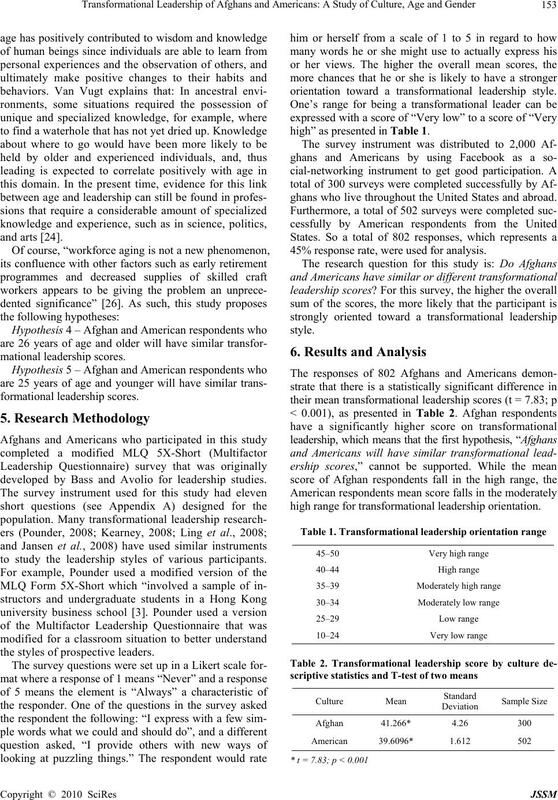 to study the leadership styles of various participants. the styles of prospective leaders. 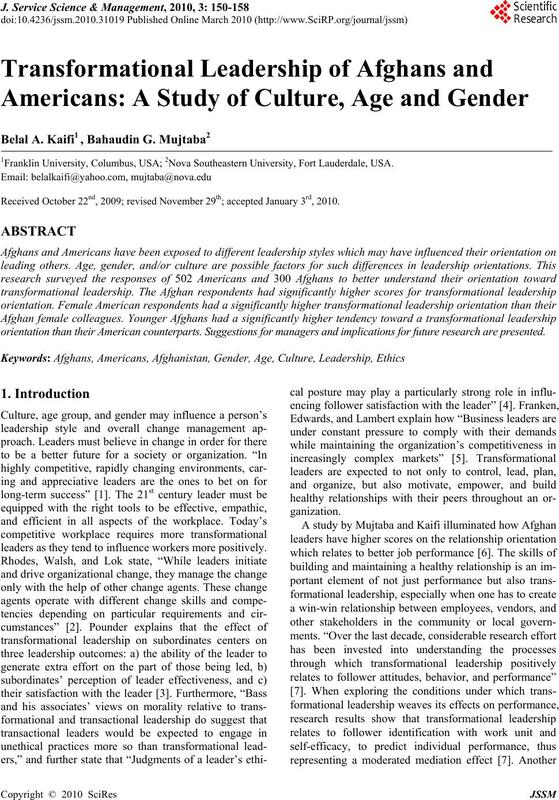 orientation toward a transformational leadership style. high” as presented in Table 1.
ghans who live throughou t the United States and abroad. 45% response rate, were used for analysis. high range for transformational leadership orientation. cantly higher score than their Afghan colleagues. zation, and a prosperous vision for Afghanistan . pared to their American counterparts. filled with people from many different leadership styles. able to compete in today’s global economy. proactivity that characterize a real brand champion . ple, applying transformational leadership principles . prove, and accomplish its goals. ghan participants that are compared to other ethnicities. tate the test subjects’ preferred and dominant reading skills. cessfully compete in today’s global economy. Jossey-Ba ss, San Francisco, 2003. Management, Vol. 19, No. 6, pp. 1170–1185, 2008.
cation for Business, Vol. 84, No. 1, pp. 2–6, 2008. Psychology, Vol. 81, No. 1, pp. 71–82, 2008.
Review, Vol. 51, No. 3, pp. 49–73, 2009.
ment, Vol. 5, No. 1, pp. 107–125, 2008. Vol. 52, No. 4, pp. 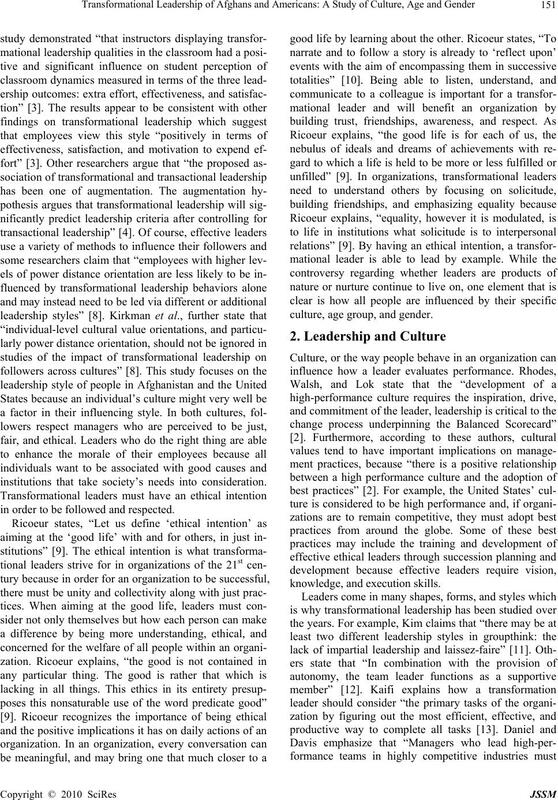 744–764, 2009.
and ‘Groupthink’,” Public Administration Quarterly, Vol. 25, No. 2, pp. 168–189, 2001. No. 1, pp. 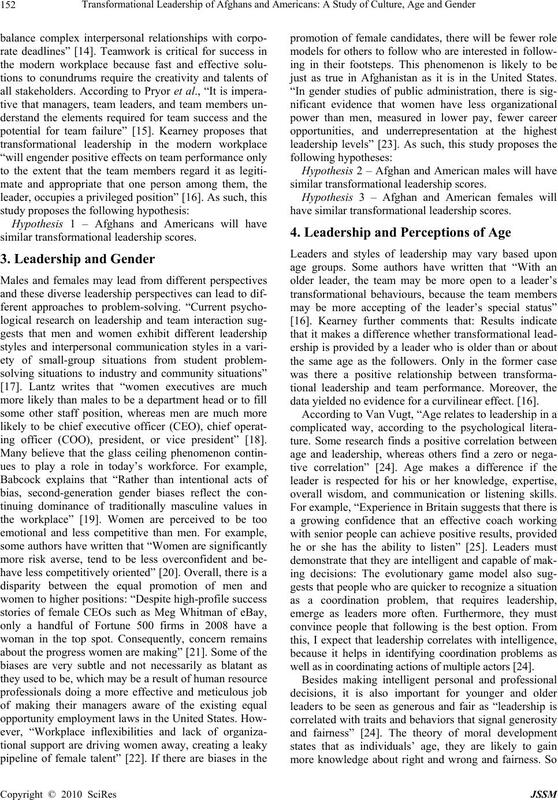 29–48, 2009.
teams excel?” Research Technology Management, Vol. 52, No. 4, pp. 40–45, 2009. Vol. 26, No. 2, pp. 320–333, 2009. 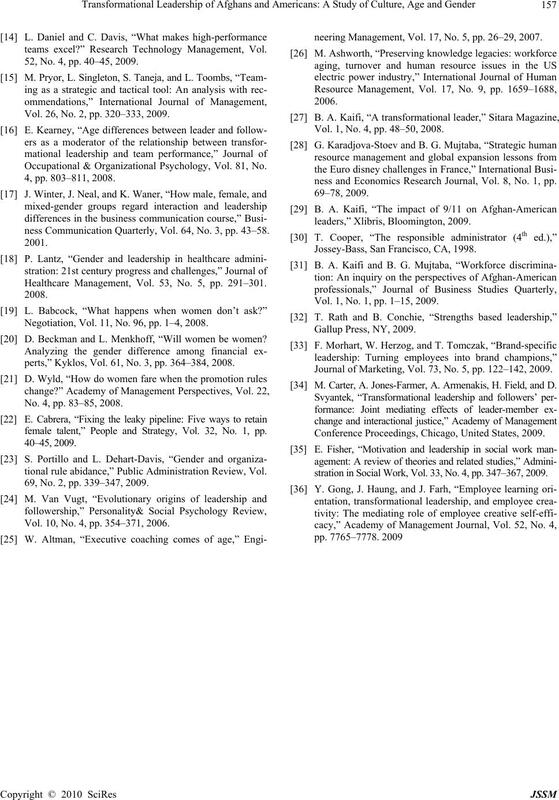 Occupational & Organizational Psychology, Vol. 81, No. ness Communication Quarterly, Vol. 64, No. 3, pp. 43–58. Healthcare Management, Vol. 53, No. 5, pp. 291–301. Negotiation, Vol. 11, No. 96, pp. 1–4, 2008. D. Beckman and L. Menkhoff, “Will women be women? perts,” Kyklos, Vol. 61, No. 3, pp. 364–384, 2008. No. 4, pp. 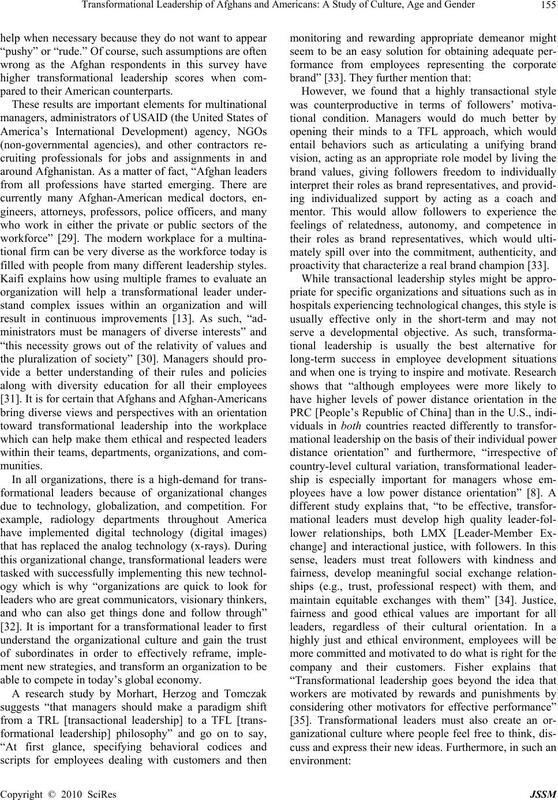 83–85, 2008.
female talent,” People and Strategy, Vol. 32, No. 1, pp. tional rule abidance,” Public Administration Review, Vol. 69, No. 2, pp. 339–347, 2009. Vol. 10, No. 4, pp. 354–371, 2006.
neering Management, Vol. 17, No. 5, pp. 26–29, 2007. Vol. 1, No. 4, pp. 48–50, 2008.
ness and Economics Research Journal, Vol. 8, No. 1, pp. Jossey-Bass, San Francisco, CA, 1998. Vol. 1, No. 1, pp. 1–15, 2009. Journal of Marketing, Vol. 73, No. 5, pp. 122–142, 2009. 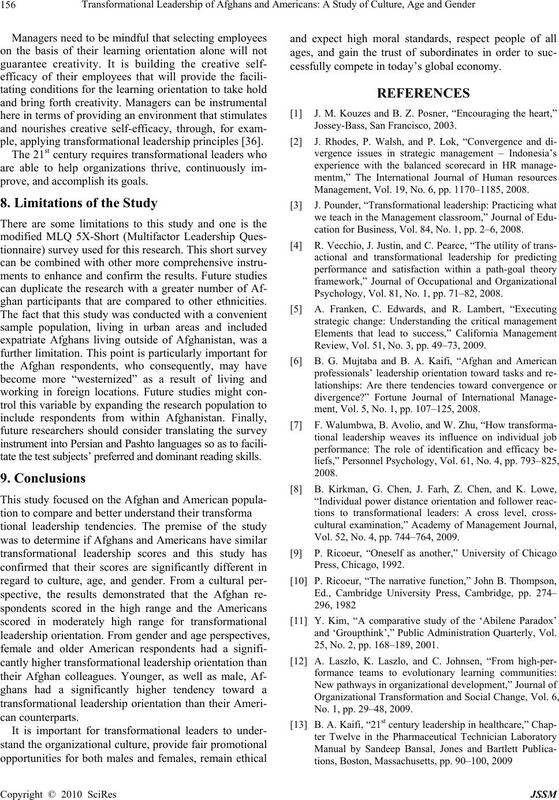 M. Carter, A. Jones-Farmer, A. Armenakis, H. Field, and D.
Conference Proceedings, Chicago, United States, 2009.
stration in Social Work, Vol. 33, No. 4, pp. 347–367, 2009.
with the person demonstrating the specific behavior. 1. I express with a few simple words what we could and should do. 2. I provide appealing images about what we can do. 3. I help others find meaning in their work. 4. I enable others to think about old problems in new ways. 5. I provide others with new ways of looking at puzzling things. 6. I get others to rethink ideas that they had never questioned before. 7. I make others feel good to be around me. 8. I tell others the standards they have to know to carry out their work. 9. I call attention to what others can get for what they accomplish. 10. Others have complete faith in me.